Nigeria - Unions in Nigeria are trying to avert another nation-wide general strike by holding a series of large rallies in order to pressure the government to recall a recent 30 percent increase in fuel prices . If the government refuses to respond to the protests by October 3rd the unions are expected to call for workers to stay home until their demands are met. A general strike last year forced the government to lower prices after only three days at a time when crude oil cost about $38 a barrel; now the price is about $66 a barrel. The price of fuel was also raised in India which sparked strong criticism by left-wing parties. New Brunswick, Canada - Hundreds of trucks slowed traffic in a number of locations along the Trans-Canada Highway and asked motorists to sign petitions calling for the government to help lower fuel prices. The action was part of a three day planned protest organized by the little-known Truckers and Drivers Association of North America. More than 3,000 miles away, south of the border, log truckers held a rally in Corvallis, Oregon and more protests have been planned in Monticello, Indiana. 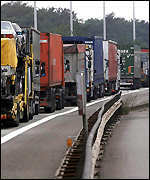 France - Truckers in eastern and southern France blockaded several wholesale gas depots in opposition to rising fuel costs. The demonstrations were planned by UNOSTRA, the truckers' association to target strategic locations in order to gain support from workers in agriculture and taxi drivers who are also affected by high gas prices.